BEAUTIFUL cafes are the symbol of a trendy city. The important, busy cities have these stylish cafes scattered throughout but small towns like Comilla or Kushtia, to name a few, however, lack these facilities. People living there don't have too many places to sit and chat over a cup of tea or coffee other than the village bazaar or major market. Today we are discussing one such cosy café in Comilla. To have a café in such a small town, certain things need to be considered. The number one problem faced is usually the budget, which is limited, as people don't invest much in such establishments in areas like these. Hence the changes and modifications should be cost-effective way. 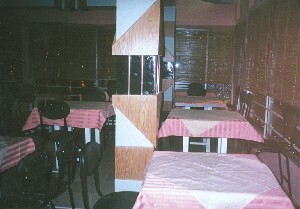 The café didn't look too impressive to start with, however a few small renovations did wonders to its dull appearance. First the floor was taken care of. An ordinary mosaic floor can be completely transformed with the use of tiles. The markets here are flooded with varieties of fashionable tiles, giving you a wide range of choices. Once the tiles were added, they gave the entire coffee shop an appearance of neatness. Adjusting a steel pipe with the stairs made it easier for the customers to climb them, and it also gave the entrance of the café a very chic look. The pipe turned into a modern pillar at the mouth of the staircase adds an extra leverage to its ambience. For beautification purposes, nothing can be compared to the use of the greens. Use of potted trees with stones and rocks added colour to the café's interior. Spotlights with mirrors and wooden frameworks were also added for ornamentation. The mirror and spotlight effect can be done very easily at a minimum cost. Owning a nice place that is both aesthetic and comfortable is like owning a piece of heaven for oneself and opening it to the public multiplies the happiness in doubles. So if you plan to open a small café in some rustic little town all you need are some simple ideas and a little sincere effort.